What will our legacy be when we are gone? 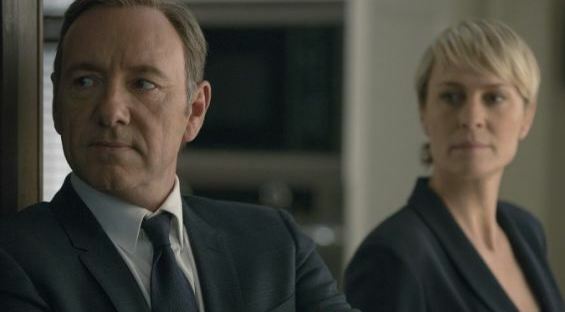 So asks Claire Underwood of her husband Frank in a poignant moment of Series 1 of the hit US drama House of Cards. At this point the fictional characters are on their way to achieving extraordinary political power, but with no-one to pass their legacy on to, she wonders is it all worthwhile? The Underwoods each display a near pathological ability to clamber over other people en route to achieving their goals. Murder, manipulation and mayhem follow in their wake and we get to see the devastating consequences for those around them. ‘Let’s face it’ says Frank, to a billionaire he has locked horns with, ‘ with people like us it is all about self-interest’. There’s something compelling about the honesty with which he embraces, rather than faces, his dark side. He plays the role of the anti-hero. As a viewer you get that he is deeply flawed and corrupted, but his clarity of vision for his life seems more attractive than many of the flailing, compromised people around him. Kierkegaard commended to us the ability to ‘will one thing’. He meant focusing all our love and worship on God. Underwood’s ‘god’ just happens to be himself, and ultimately that is shown to be a most unattractive god to assign all your worship to. Where Underwood embraces power, many shy away from it initially and yet later get corrupted by it. That’s true for our biblical anti-hero Gideon. His life is marked by a cowardice that is displaced by a confidence through some very directive divine mentoring (‘arise mighty warrior’ – see last post for more). Yet the confidence is tragically misdirected from the outset. We imagine that his initial cowardice was because he could not visualise fulfilling his divine mission in his own strength. Then faced by overwhelming evidence that he would be successful against all odds (again see last post) he gets the remnant army he leads to fight with the rally cry: ‘FOR THE LORD AND FOR GIDEON’. Why ‘and for Gideon’? Because Gideon has most certainly not got Kierkegaard’s revelation that it was all about God. As Jesus put it ‘apart from me you can do nothing.’ When he was a coward it was because he was thinking of himself. When he was courageous he was also thinking of himself. The ‘I’m not good enough’ had changed to ‘I am good enough’. So what was the legacy? Outwardly and initially very good. Midianites routed. Gideon installed as leader. He even resists the call to be made King by his wannabe subject… and yet… and yet… and yet through the next 40 years of peaceful rule, guess who established his rule more and more powerfully, and guess who calls one of his 70 sons a name which means ‘My father – he’s the King’. Even after the initial victory Gideon’s fickle insecurities rear their head again, and with a desperation to continue being a mouthpiece for God he taxes his people a gold earring each, and melts that into a priestly breastplate called an ephod. These were used by priests for discerning the will of God. It was not something Gideon was permitted to wear. It would be used to give him quasi-religious power as well as the secular power he at first seemed to askew. And it caused his people to turn away from God and bring their attention instead to Gideon a more tangible ‘flesh and blood’ ruler. Gideon fights a mighty battle, where the result was gifted to him by God. He has his moment of extreme, even reckless courage, and he is commended for that – for his faith – in Hebrews 11. And yet what will his legacy be when he was gone? Joshua who we explored earlier this term left a legacy of peace in the entire generation after he was gone. Gideon leaves a mess. He’s not a pathological evil person like Underwood, just a fairly typical example of the human race. We cry out to God sometimes in our times of need (even if we never admit to ourselves or others later that we have done so). We occasionally experience extraordinary deliverance. Crucially we experience this in the gift of God in Jesus on the cross and all that can mean for us in terms of defeating the entangling powers of sin, self and destructive ambition. And yet we struggle to do anything for the Kiergegaardian pure motivation of pleasing the true God alone. But that is also the seed of our demise. While we long for status and significance that comes not from God’s verdict on our lives, but on other people’s opinions, we will always go increasingly off-track. Just this last week I encountered an old friend from college days. He was wondering what had become of that ‘passionate for God but angry young man’ he knew back in Bristol who had wanted to change the world by yesterday. That is not the easiest of questions to answer, but one change I know that occurred in me was one year into my second ordained job, when I was in Pioneer Ministry. After a year of some growth and success from a standing start our team and momentum was starting to dissolve around me. For three long and painful surgical months God taught me the deep truth of ‘apart from me you can do nothing’. Then almost as a release he gave me the words of Paul: ‘I can do everything through him who gives me strength’. That has always stayed with me, and it reminds me of what happened with my public speaking ability a decade or more earlier. It was a lonely evening in Camp Dunovats, near Tulcea in Romania, in late July 1995. On a Christian camp a thousand miles from home and my family, I prayed almost against my better judgement for my own sign ‘Lord, send your Holy Spirit on me’. When Gideon was possessed by the Spirit in Judges an army rallied around him. My experience was less dramatic, but for me had a similar effect in confirming calling. The next evening I stood up to speak in front of a crowd of Romanian villagers and the people on the camp. I had been reluctant to do this, as although at school I often pursued opportunities for public speaking, I was astoundingly rubbish at it. I watched sixth-formers sleep with their arms on their tables when I tried out for the debating society and bored them to the point of dozing with my poorly read monologue on fox-hunting. But in this moment in Romania I stood, spoke and found people were listening. The same effect carried on back home, taking a whole sixth-form assembly on the overwhelming experience of God I had had in Romania the night before this public speaking incident, and on other occasions like my baptism and first preach aged 17 thanks to my bold and brave pastor Gordon Steer. While I actually handled this gift very badly at the beginning, and quickly got identity wrapped up in it, and even pride, yet I knew that this ability to speak I knew came from God and God alone. What I still needed to know as a Pioneer, and need to know, now is that all ability comes from him. That means all glory goes to him. Gideon’s initially cowardice was actually the very opposite of humility. Humility is not ‘that we think less of ourselves, but think of ourselves less’. Throughout his life, whether thinking that he would fail or succeed, his error was in thinking of himself. While he was a famed military conqueror, the proof of his life came in his role in peacetime. The Christian journey is towards willing praise for one thing alone. That thing can only be the Lord God Almighty – three in one. At that point we stop asking what our legacy will be, and work instead that ‘his Kingdom may come’. What an adventure it would be to be part of building that Kingdom, and not worrying at all about our own. Amen to that! I think there’s a kind of lack of humility that can come up when we’re younger through a kind of ‘I know better’ attitude compared to what’s gone before. The problem of lack of humility though is also ever present as one gets older because of ‘I’m experienced, I know this’ and ‘I don’t need anyone to correct, advise me because…..I have lived in this world a while and I just know what is right’. Maybe the road that Gideon went down.